Whether you’ve overdone it the night before or you’re simply enjoying brunch, the Bloody Mary is an important feature of the cocktail world. 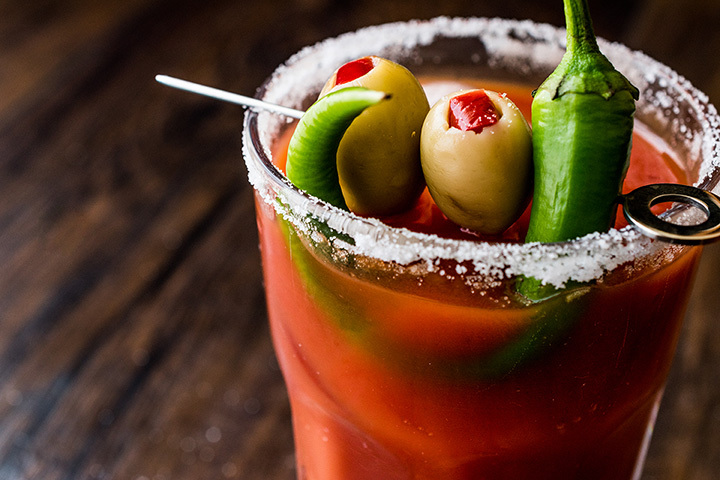 Whenever you’re having it, Vermont is serving up some mean Bloody Marys that you’ll have to try. Here are the 10 best spots to get them in the state. Offering what many would call the quintessential American breakfast, this spot has been serving up Eggs Benedict and French toast for years, and their weekend brunch is even what one local newspaper called legendary. However, according to that same source, the Kahlua French toast and the mind-bending Bloody Marys are what really keeps the masses coming back. Previous winners of the best Bloody Mary award, Misery offers a well-dressed Bloody Mary at its famous Sunday Disco Brunch. This Mary offers flavor with notes of lemon, lime, olive, endive, and, of course, tomato, and the garnish reflects that. Plus, it is no wonder people love Misery, as this spot offers kicked-up farm to table dishes that have earned them several James Beard nominations. If your idea of a great Bloody Mary is what looks like a gazpacho soup in a mason jar garnished with a mountain of peppers and a lemon wedge then you have hit the right spot. Actually, there are two Mary’s on the Brunch Menu here, and they both come with a house-made mix and Tito's vodka, while the special includes bacon, olives, shrimp, pepperoncini, and a pickle. This farm to table eatery in the Green Mountain State’s capital city boasts elevated homestyle food and tumultuous but inspiring history. Plus, their Brunch Menu offers four variations on the Bloody Mary, including the traditional cocktail, the Michelada, the Smokey Maria, and the Bloody Angel. Each drink features a killer house-made mix and unique twists on the original, like smoked ice, bourbon, and beer. Wait! What?! What is a burger joint doing on a Bloody Mary list? Hold on. Worthy Kitchen is Worthy Burger’s (Royalton, Vermont) farm-to-table restaurant in the pastoral town about 30 clicks south of the original location, and their Bloody Mary is what one reviewer called “a beautiful thing.” In fact, it has also been said that you get the taste of fresh local veg in every sip. You have seen Penny Cluse noted before on our breakfast write-up, but have you tried their Bloody Mary? This spot is famous for its gingerbread pancakes and breakfast sandwiches, but did you know it serves breakfast all day? Plus, their Bloody Mary is one of the freshest around and comes garnished with olives, whether you order it virgin or spiked. Pro Pig is one of our favorite places on the planet, and nothing goes better with smoked meat than a spicy Bloody Mary. While it is not featured on their menu, this Mary, like so many things here, can’t escape the smokiness and spiciness of a great barbecue. So, expect nothing less from the Pig, as their spin on this classic comes with a bacon-salted rim, tons of veg, and some nice spice. Sometimes it’s not about quality cocktails mixed for you, it is about choice. And Sunday Brunch at the Shelburne Tap House includes a lot of choice in their $8 Bloody Mary Bar. Here, you can build your own cocktail the way you like it with ingredients like tomatoes, Clamato juice, hot sauce, horseradish, cheese, salami, maple bacon, dilly beans, pickles, celery, and stuffed olives. Look. Drinking and skiing is never ok. But it is all right to admit you got a little crazy at the lodge the other night. Therefore, it is a good thing for you that breakfast at the Upper Pass means you can order as many $4 Bloody Mary’s as it takes to clear your head, not to mention, you can find all kinds of breakfasts goodies to fill your tummy and maybe make it stop churning for a bit. RJ’s knows a thing or two about good food, and you have seen them in our lists before. But, as it turns out, they know a thing or two about brunch, too. We are talking breakfast tacos, corned beef hash, biscuits and gravy, and eggs bene. Plus, drinks include the House Bloody Mary that comes with garnish options like bacon, shrimp, beef jerky, and a pepperoni straw.